As manufacturers are discovering, rubber floor mats are part of a complete cabin solution that promotes operator safety and equipment performance. By understanding how rubber flooring is designed and made, manufacturers can determine if a custom-fabricated solution is the right choice. For starters, however, engineers may want to compare rubber to other flooring materials. In a mobile equipment cabin, an operator’s feet may stay in the same position for long periods of time. 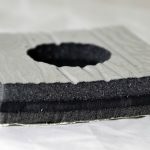 With carpet floor mats, heel wear can create holes that expose the subfloor, introducing a potential safety hazard and providing a path for engine sounds. Plus, unlike carpeting, rubber floor mats won’t stain. 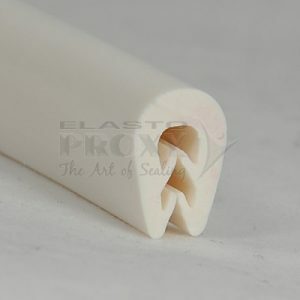 Rubber is also easier-to-clean and provides greater wear-resistance. Rubber flooring is usually black, but mobile equipment manufacturers can choose colors such as gray or brown instead. 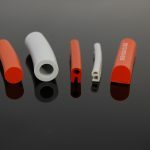 Custom colors that complement larger product designs are also available. Some rubber is smooth, but floor mats and flooring can have a pebbled texture instead. Rubber floor mats can also have recessed, diamond-shaped features to catch the dirt, mud, snow, or water from an operator’s boots. 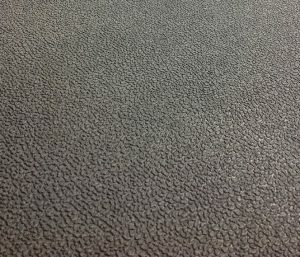 Fabric carpeting absorbs sounds, but rubber flooring is part of a complete noise-control solution. 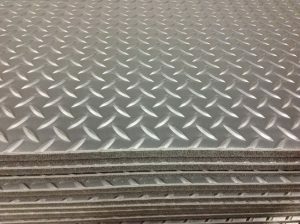 In mobile equipment, rubber floor mats can be laminated to acoustical foams that are typically 3/8” or 5/8” thick. 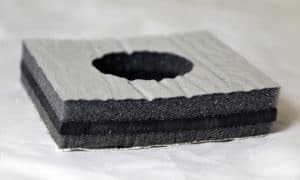 These foams can absorb or dampen loud sounds and even tune-out specific frequencies, such as the low-frequency rumble of a large diesel engine. Rubber flooring that’s custom-fabricated can save mobile equipment manufacturers time and money. Cutting rubber sheets with hand tools is time-consuming and may result in significant amounts of material waste. If an employee tosses a poor-quality cut into the trash, managers may never know how much rubber flooring a job actually used. Custom-fabricated flooring that’s water jet cut uses a form of digital manufacturing that works directly from an engineer’s CAD files. For the rubber flooring that’s near the driver’s seat, water jet technology cuts precise openings for the arms that attach to gas and brake pedals. Water jet cutting can also produce bolt-holes for flooring near seats and smooth edges for where rubber kick plates meet cabin insulation. The lamination that’s used with rubber flooring also involves skill, speed, and precision. By combining layers of different materials into an “insulation sandwich”, a custom fabricator can deliver rubber flooring that meets all of a project’s requirements. A complete sealing and insulation like this can absorb sounds, protect metal subfloors, and reduce slip-and-fall hazards inside the cab. 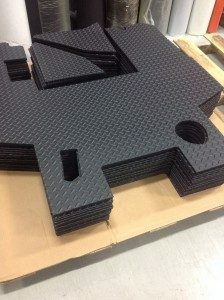 Elasto Proxy custom-fabricates rubber floor mats for mobile equipment. In addition to water jet and abrasive water jet cutting, we provide lamination services. Our capabilities include design assistance and help with material selection. 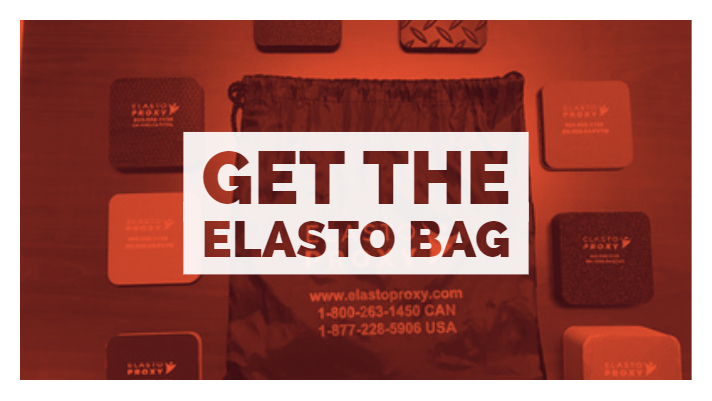 For samples of our mobile equipment insulation, get your free Elasto Bag. Click here to request one.